Today my boyfriend and I went to the local Antique Village (a whole street lined with antique shops and boutiques) in Denham Springs, LA. In one shop, he found a license plate from 1965 for his newest addition to his Volkswagen collection he bought yesterday (A 1965 Beetle). And He also found a 50's model Beetle toy that's in VERY nice shape! In my parusing (sp?) he found a Barbie horse that was said to be 1950's. 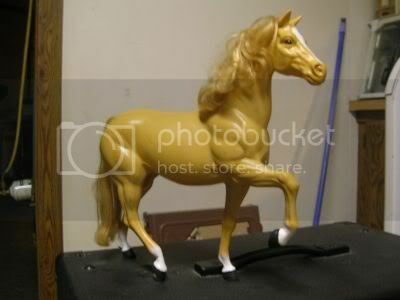 Well, whether that was true or not, I didn't know, but the model is different from the Barbie horses I grew up with. I have collected the Grand Champions and a few Barbie Horses here and there, and currently have some Barbie horses from the late 90's or so. 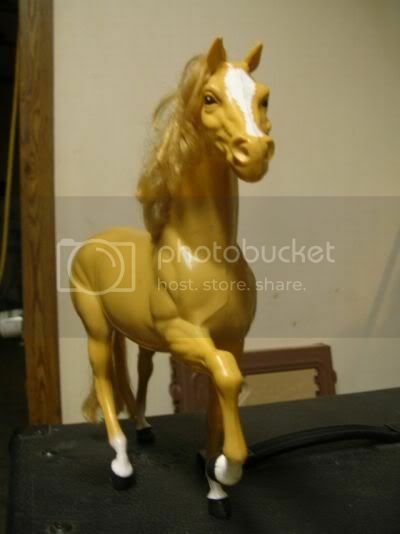 After just researching the info on Barbie horses, I found that the particular horse I have is named Dallas, and was Barbie's horse. His pose is different from that of the newer models and is the first of the more realistic models. They first came about in 1980, and eventually they produced a stallion named Midnight, who "bred" with Dallas to make a filly in 1983 named Dixie. So, here are a few pics so you can see the condition she's in. I think it was a great find, though it isn't circa 1950 (I could strangle the dealer wo didn't take 15 minutes to do some research) and I only paid $15 for it. So, here she is. Think I should get her restored? I found a Skipper doll and Dallas on eBay for $9.00 or so. I think I got ripped! lol! I had that same horse- yep, Dallas was the name. Circa early 80's would be right too- Congrats! Kinda makes me wonder what ever did happen to mine, man I loved her so much, I always wished my horse would grown the same kind of mane (I had an appy, so I wished extra hard)! That's her. I have Midnight and one that was Skippers pony. I think her name was Honey. I could be wrong. She is chestnut with a little blaze. My daughter plays with mine now. Heheheh...I have Dallas, Midnight, Skippers horse, and the truck and horse trailer too:-) Man I loved playing with them!!! I have that one too! Anyone want it? ANYONE GOT BARBIE HORSES FOR A GOOD PRICE ??? IM IN NEED OF HORSES FOR MY COLLECTION. 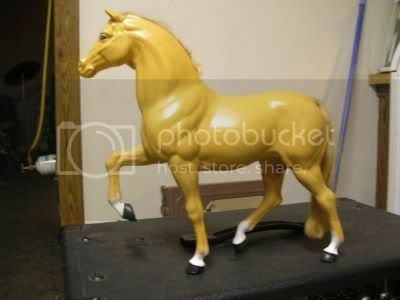 LOOKING ALSO FOR SHANIA BARBIE HORSE !! HARD TO FIND.